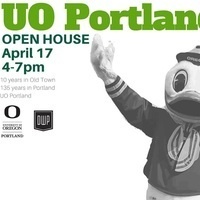 Join us for an Open House and celebration of the University of Oregon in Portland. UO has been in Old Town for 10 years and in Portland for 135 years! Come get your picture with the Duck, hear from Duck entrepreneurs, find your future graduate program, experience 360 video/VR and more. Socialize, snack and see what the UO has been up to in Portland! This Open House is part of Design Week Portland. Feel free to register at this link.